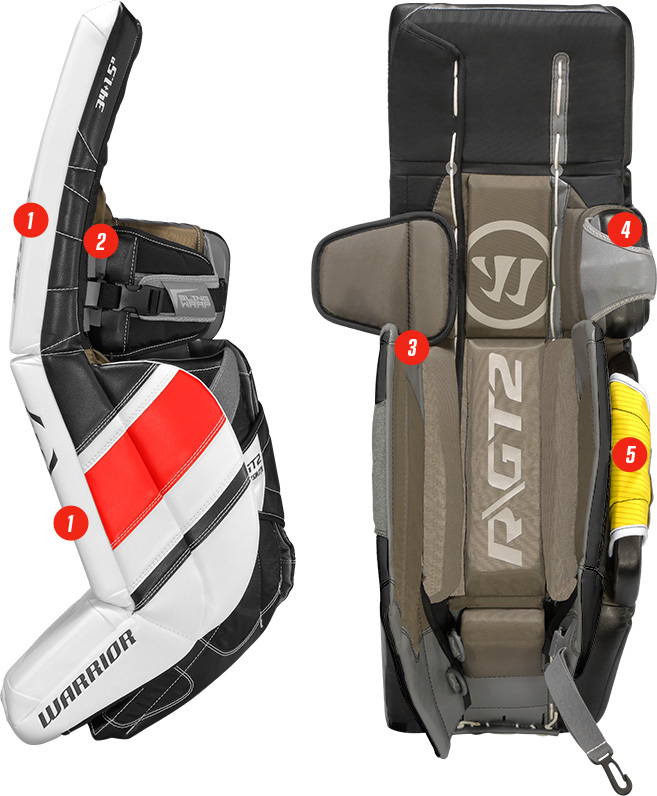 HyperComp Thigh Rise improves stopping power in the butterfly for better 5-hole coverage. Torsional Core design for traditional feel & added mobility. New high density face for faster rebounds. Boot Taper for improved mobility. 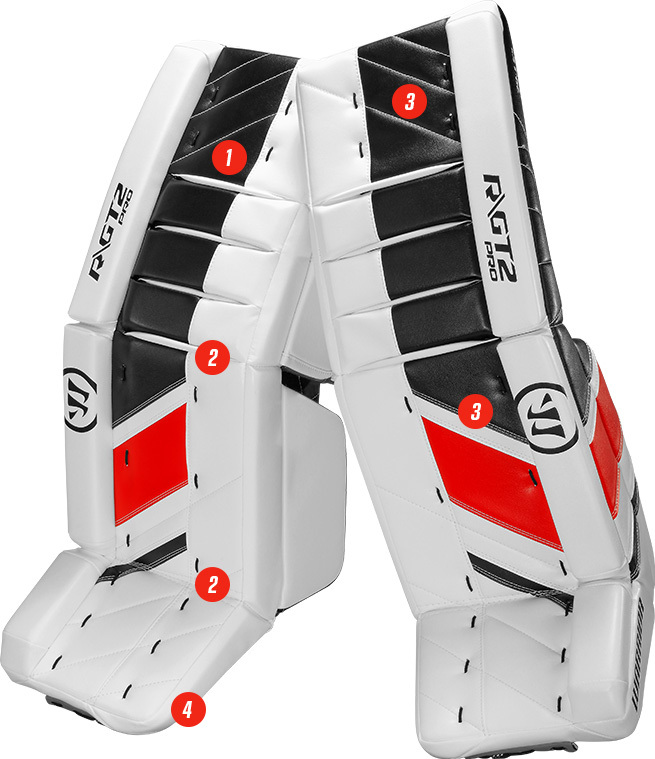 Standard outer roll height provides stopping power that prevents pucks from skipping over the pad. 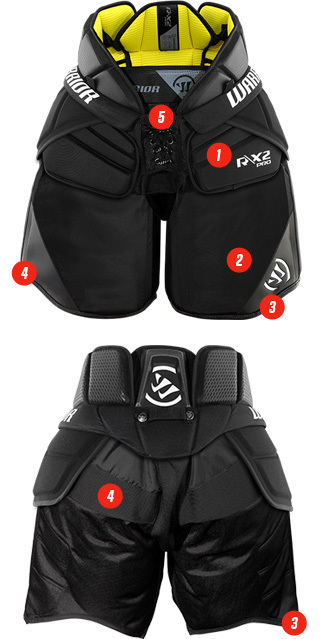 Two outer knee wing options for a custom fit & feel depending on knee pad size. 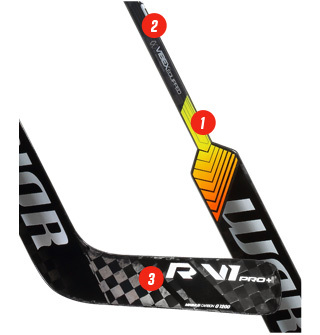 360 Degree Active Drop Leg Channel for increased 5-hole coverage & added mobility. Added length & stability to knee block from previous R/GT. New thumb shape creates a more conventional feel & increases game ready snappiness out of the box. New double tee pocket increases pocket size & puck retention. 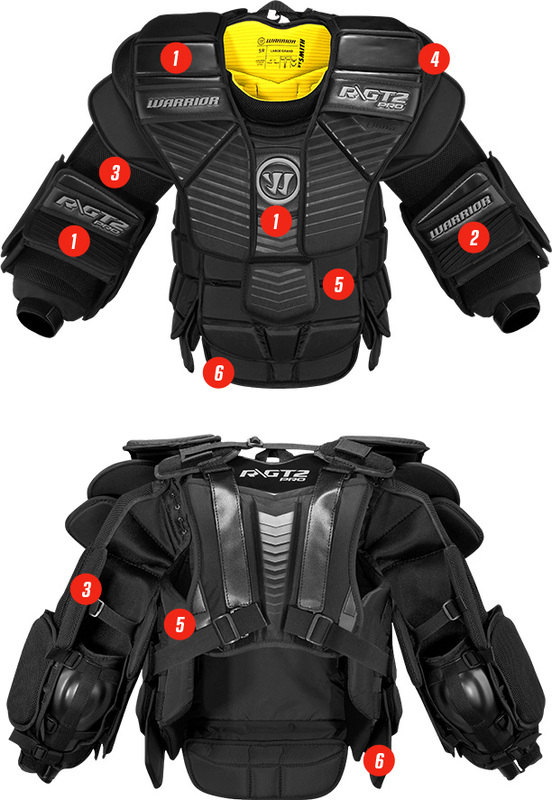 HyperComp increases protection across the catching surface of the trapper. 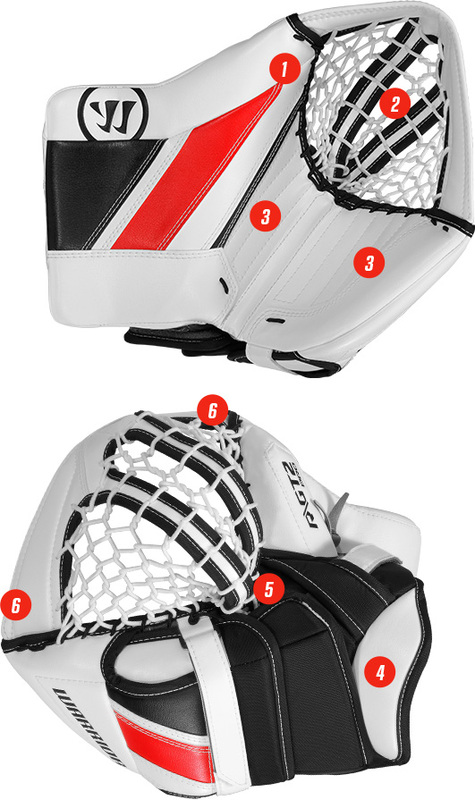 Open cuff design allows the goaltender to present trapper square to the puck without chest & arm interference. New 75 degree catching angle. New tee construction improves stopping power & open/closure snappiness. 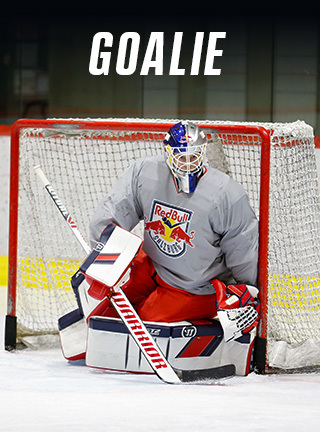 New HyperComp blocker face & sidewall for faster rebounds & improved board stability over time. Bindingless perimeter reduces weight & improves durability. 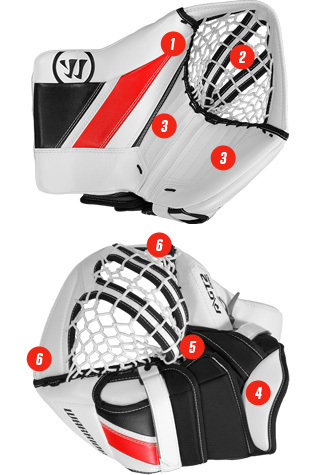 Contoured sidewall aligns with the goalie’s stick to prevent puck impacts against the finger. 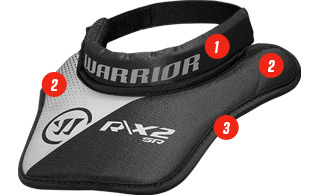 Adjustable open cuff design for enhanced rebound control. Customizable fit, feel & board positioning. Adjustable & removable index finger protection. Adjustable 3D molded caps for optimum protection & feel. HyperComp inserts increase protection and stability in high impact zones. Double shield front elbow floater maximizes protection against high speed shots. Squared biceps maximize coverage and enhance rebound control in the upper arm section. 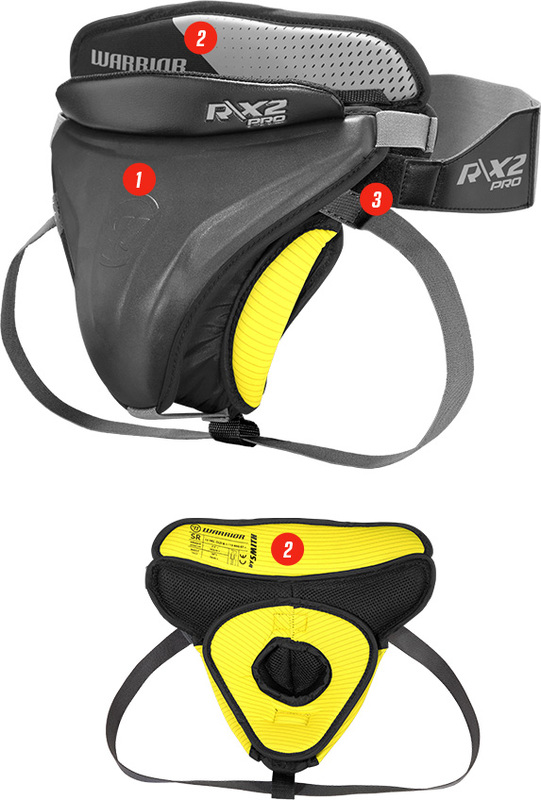 Rounded shoulder shape decreases mask interference for better mobility. 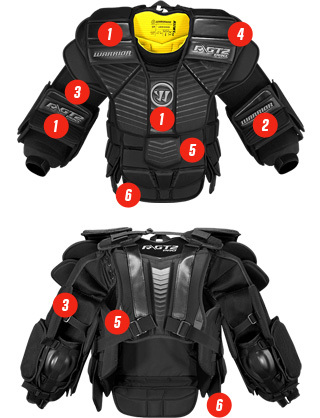 Improved chest block design completely wraps the stomach and ribs for full protection on a shot from any angle. Removable front/side length extensions allow custom fit and pant integration options. HyperComp Flex Plates provide pro level protection and unprecedented flexibility and mobility. 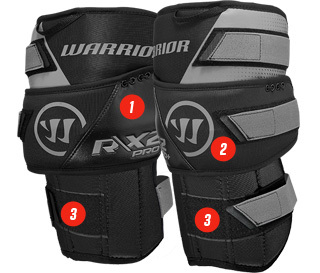 Maximized thigh protection from high impact shots. 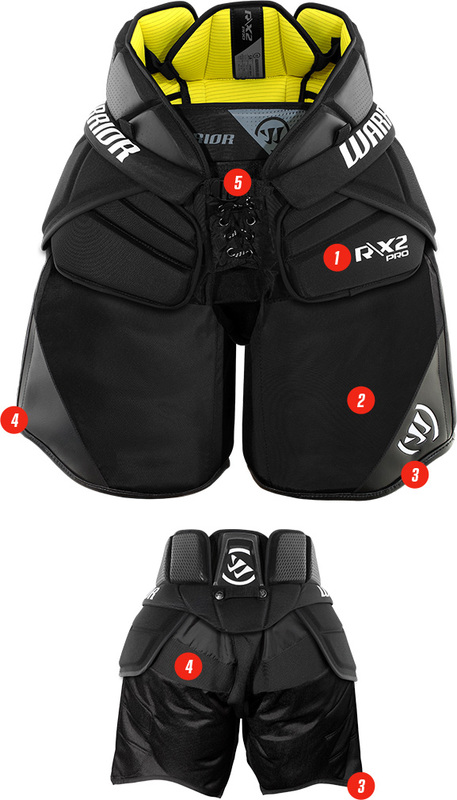 AxyCut technology allows the goal pant to sit flush & square in the butterfly without leg pad interference. Reinforced high wear areas protect the pant from Velcro exposure. Removable internal belt provides snug, comfortable, easy to adjust fit while allowing the external pant to fit looser for un-restricted mobility. 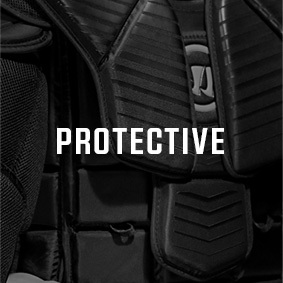 ShockShield Technology disperses energy from puck impacts away. 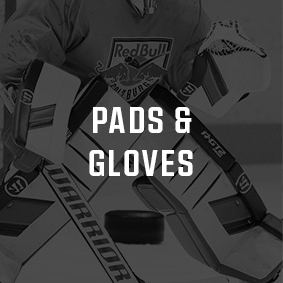 Ergonomic abdomen pad flexes as the goalie gets into a deep crouch. 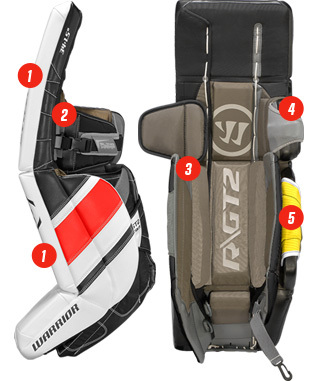 Customizable strapping allows goaltender to adjust jock setting for desired fit and feel. 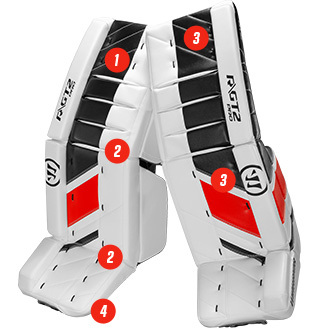 Wide profile for maximum coverage in the 5-hole area. 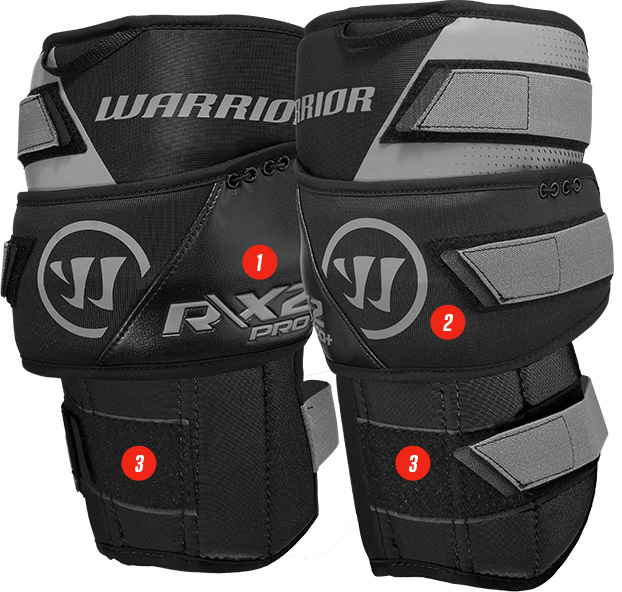 HyperComp reinforced knee plate for increased protection and weight reduction. 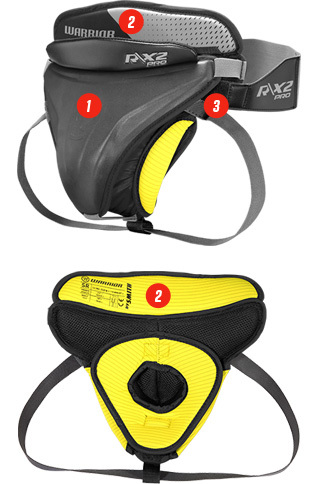 Optimized shock absorbing landing area for additional knee cushioning and support in the butterfly. Additional neck protection from puck impacts. 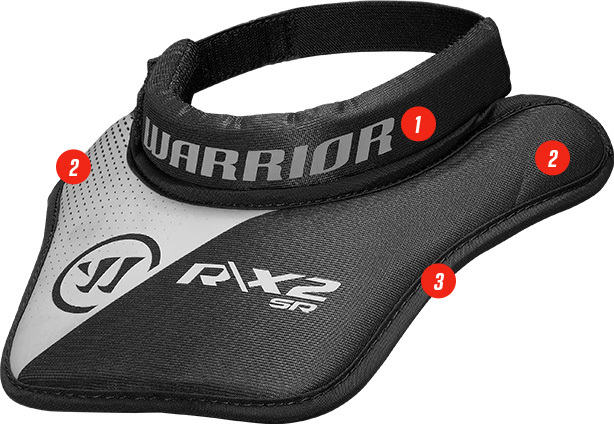 Reinforced collar bone padding for increased protection beneath the chest & arm. 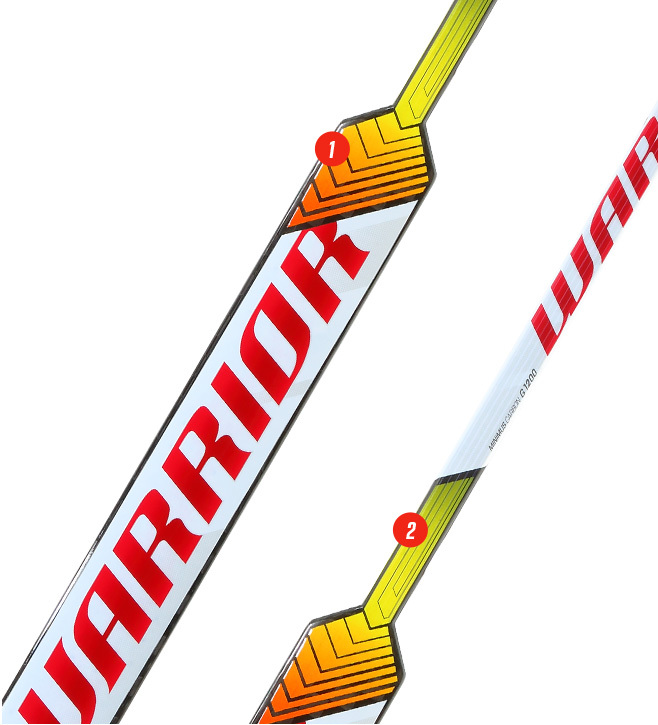 Super lightweight goal stick for quicker stick & blocker saves and reduced arm fatigue during play. 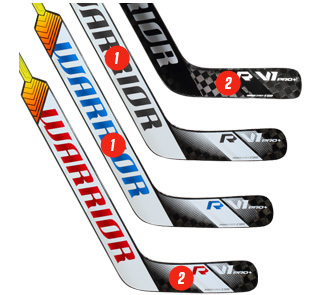 Minimus Carbon G1200 reduces weight & increases durability from puck impacts. 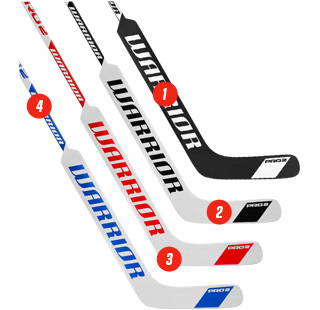 SlideGrip Technology provides grip to securely hold the stick while enhancing quick sliding blocker transitions for pokechecks and passing positions. HiFused Construction creates neutral balance for optimum feel. 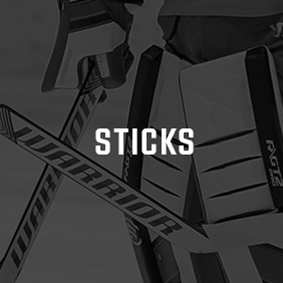 VibexLite reduces the shock of vibrations that travel through the stick to the blocker hand. 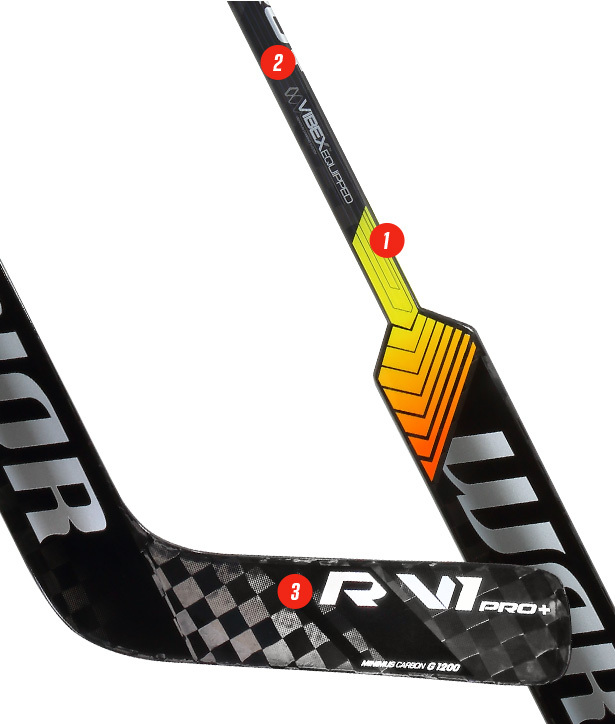 Impact Fiber Layer provides an additional layer of carbon fiber on the front face & edges of the shaft to increase durability against puck impacts. 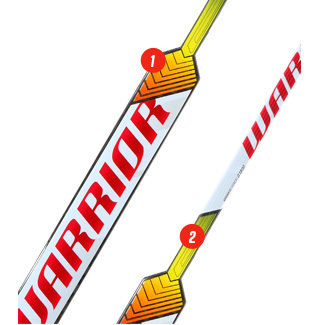 TwinSpar reinforcement improves blade stability for enhanced shooting & rebound control. Pro balanced construction with Urethane RIM molded core & blade for exceptional balance and feel. 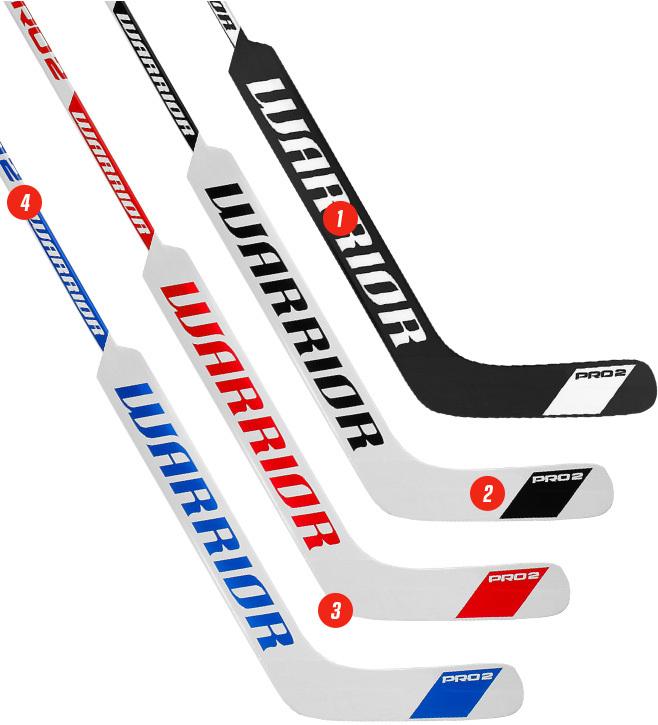 Pro strength deluxe blade provides blade stiffness for rebound control and increased durability against puck impacts. ABS insert along blade and heel insert provide additional durability support in high wear areas. 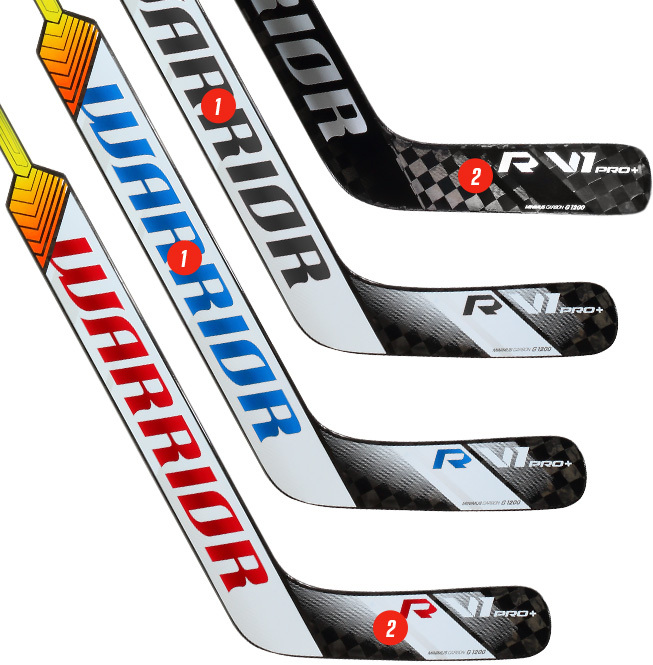 Birch and Aspen shaft with additional fiberglass laminate layers for unprecedented shaft durability.